We are sitting in a French restaurant in a quiet locale enjoying a three-course meal with sumptuous wine. Outside, we hear chants from a centuries-old wooden temple. 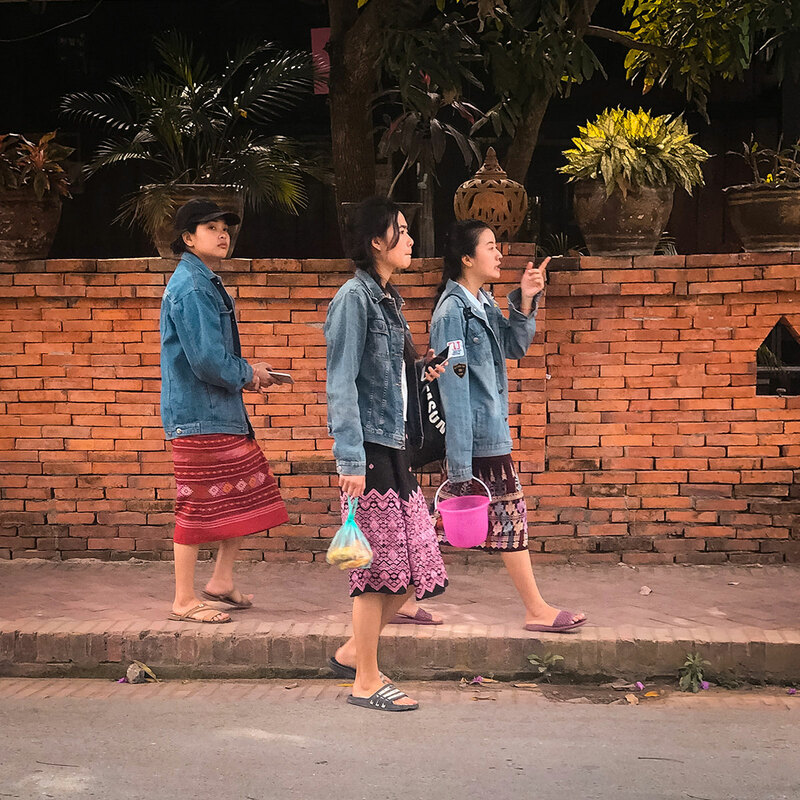 On the street, local residents easily mingle with backpackers and affluent visitors speaking a panoply of languages. 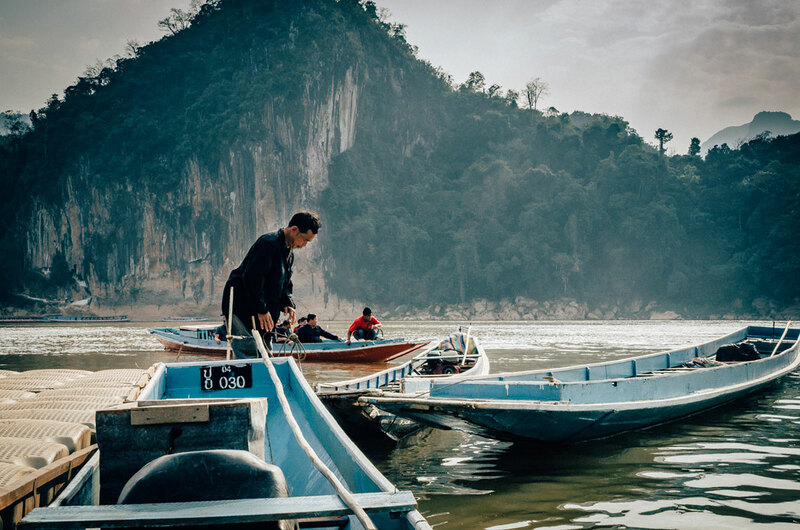 Nearby is one of the longest rivers in the world with giant catfish, stingrays and dolphins. 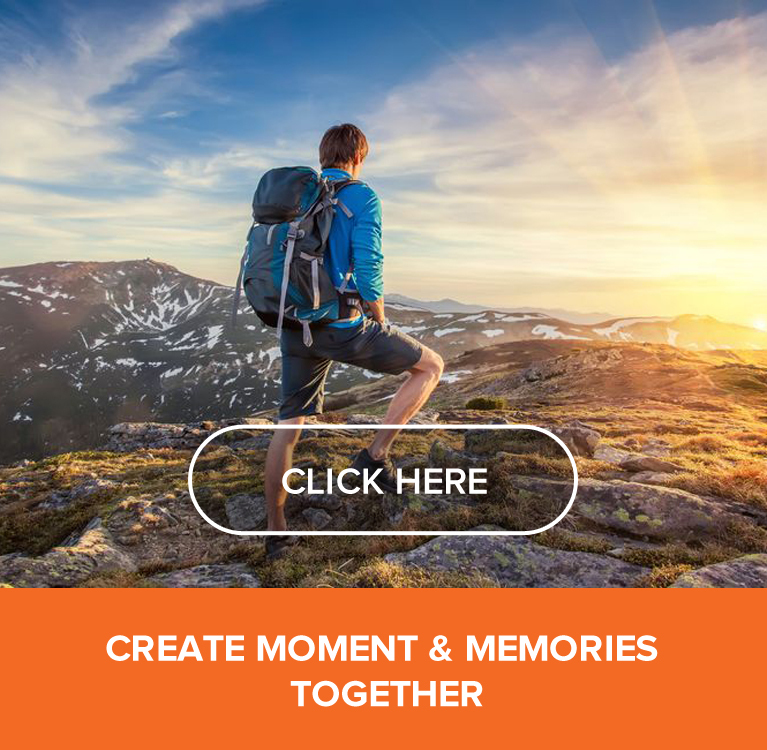 Across the river is a vast expanse of dense forest, mountains, limestone karst, waterfalls, and wild animals including bears, elephants and monkeys. This place is not an remote outpost from a bygone era in a forgotten novel. It exists. 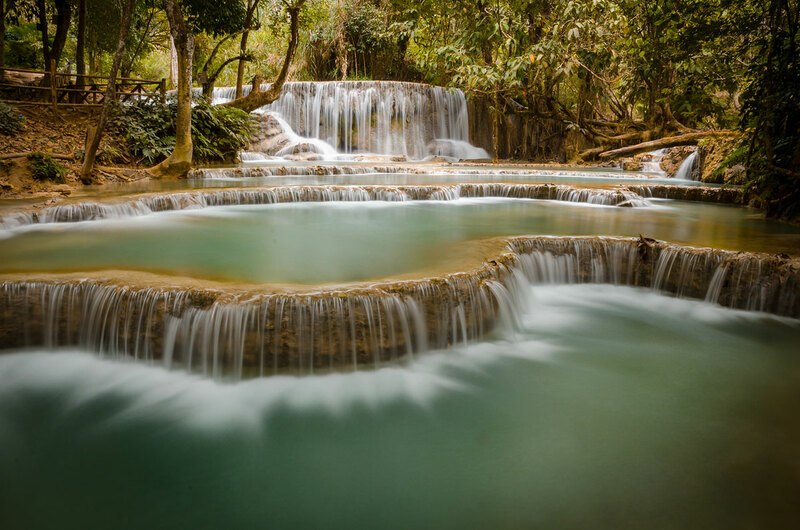 The name is Luang Prabang, located in the Lao People’s Democratic Republic. 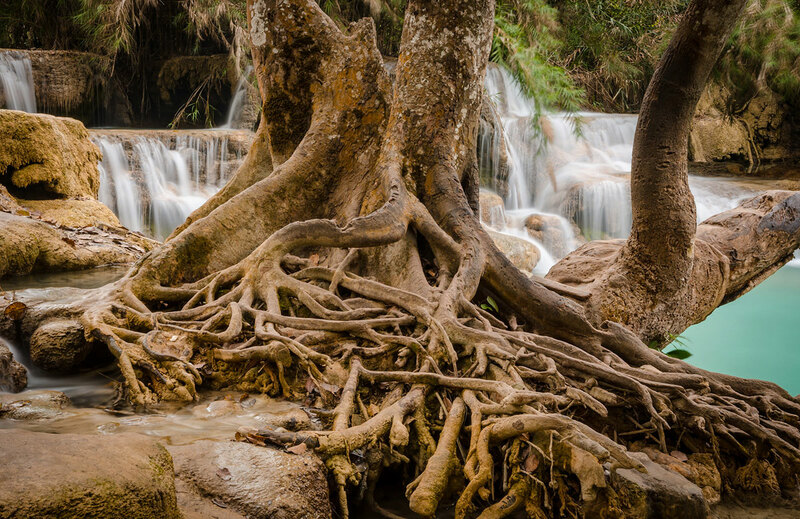 Luang Prabang has been inhabited up to a whopping ten millennia. 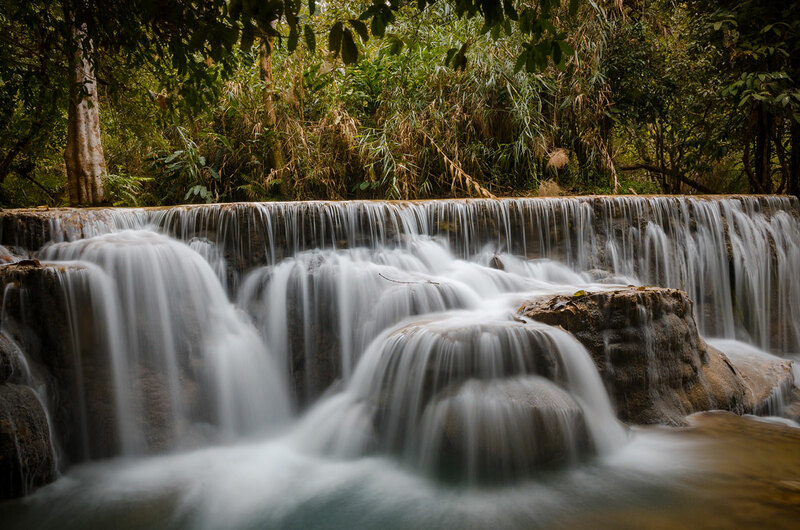 In the 14th century it was the capital of the first Laos Kingdom. 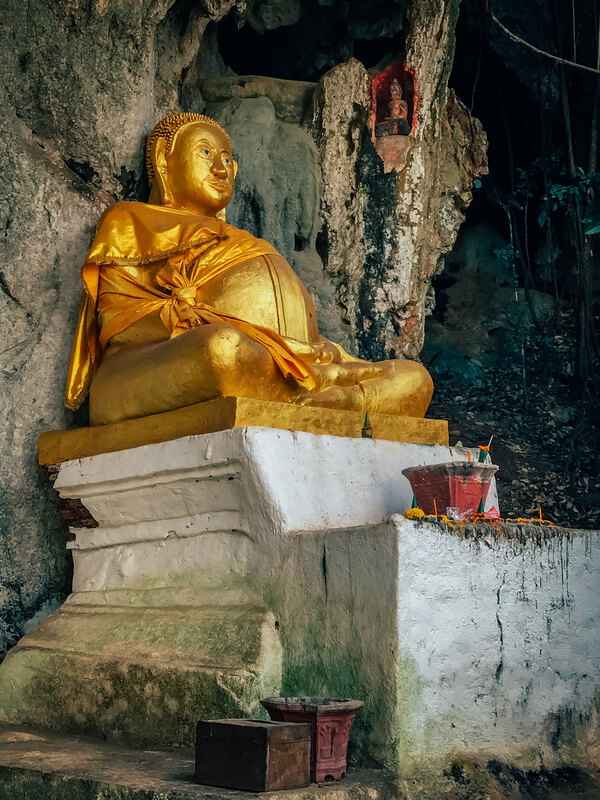 The city had various names until King Fa Ngum accepted a golden Buddha image called the Pha Bang from the Khmer monarchy and the city was then known by its current name. 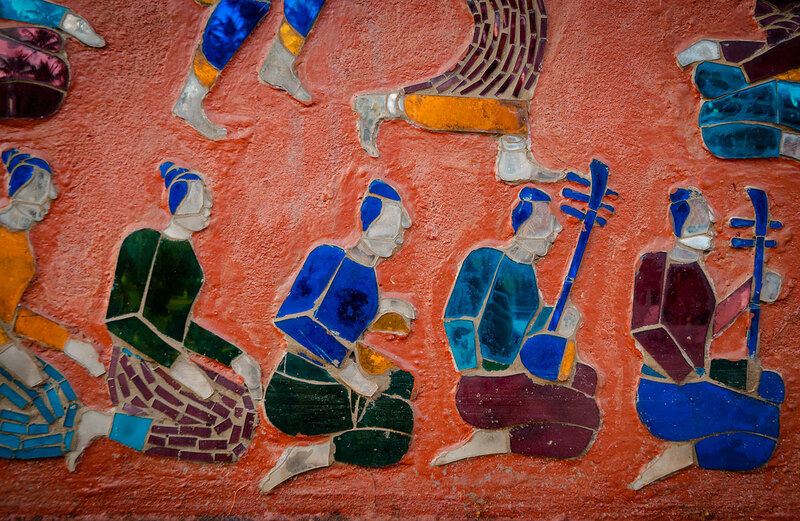 In 1545, its significance shrank as the capital was moved to Vientiane but it remained a regional center. The city was inhabited by the French during the colonial period from 1893 to 1946. While known by intrepid travelers, it was a sleepy outpost with amazing Buddhist temples and crumbling French architecture until the late 1980s. 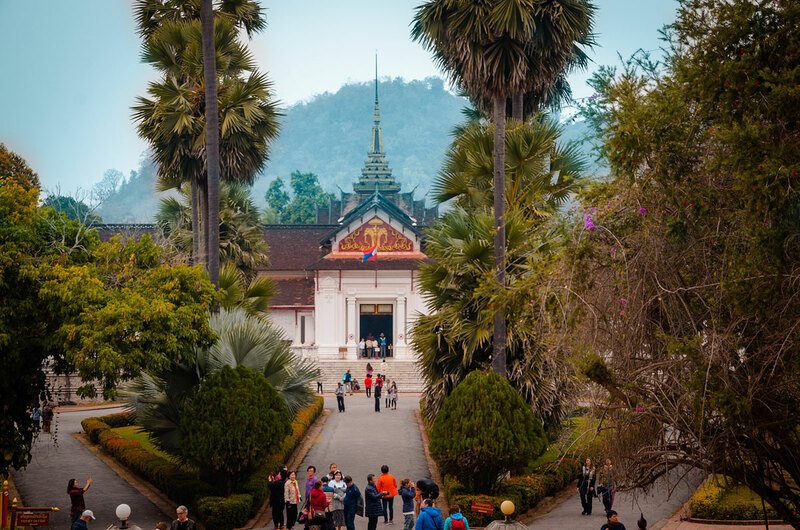 UNESCO describes the site as “an outstanding example of the fusion of traditional architecture and Lao urban structures with those built by the European colonial authorities in the 19th and 20th centuries” and declared it a World Heritage Site in 1995. 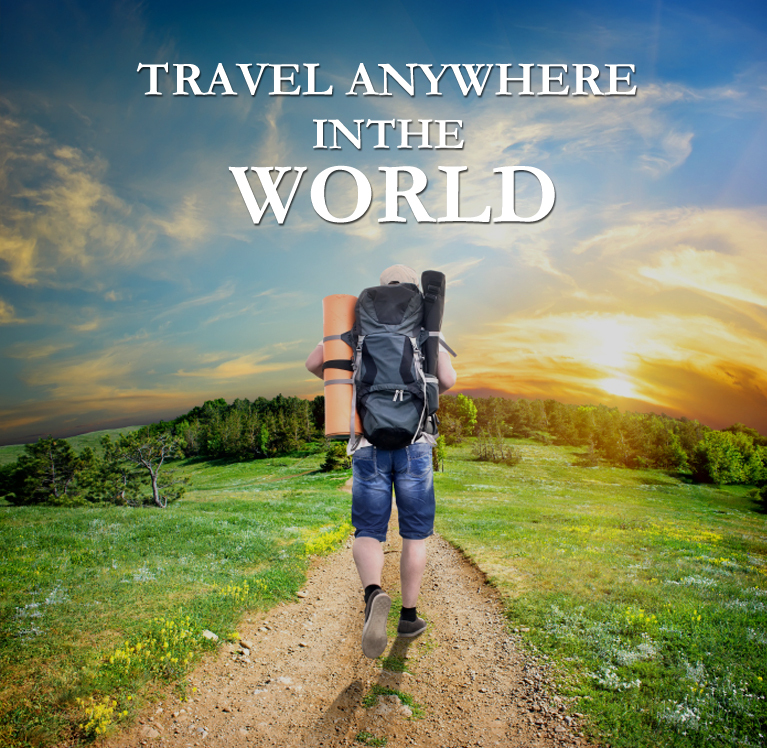 For the last thirty years, tourism has gradually increased and there is an infrastructure of hotels, restaurants and shops. Despite the development, it exudes a laidback charm, which visitors and expats cherish. The city is small and the area of interest is even smaller. 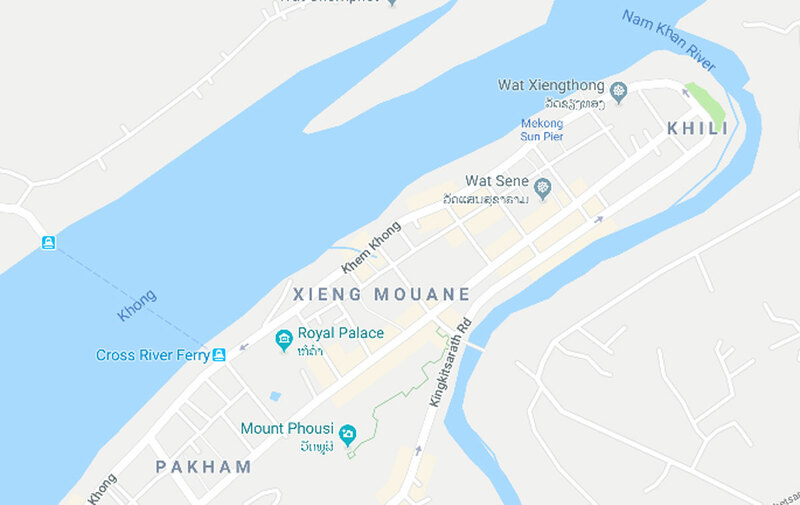 Luang Prabang borders the Mekong (or Khong) river on the west. On the North, the Nam Khan River snakes through the town. Where the two meet is the end of small peninsula with several temples. It is also the beginning of Sakkaine Road, the main drag with several boutiques and restaurants. It is a 20-minute walk from the tip of the peninsula to Mount Phousi, a small mountain that anchors the city. In a walk of another 20 minutes, there is the Royal Palace, the former residence of Lao royalty. This general area, with excursions out of the city could occupy a visitor who likes the vibe of the city easily for a week. 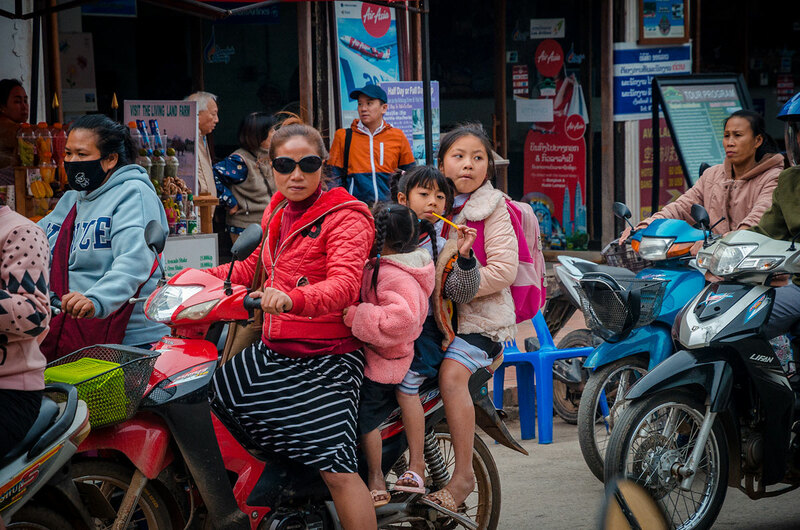 My wife Khadija and I had spent three weeks traveling in Myanmar, then joined up in February 2018 with our friend Mike in Angkor Wat in Cambodia. See http://exploringed.com/angkor-wat-millennium-wonder/ for a detailed description of this amazing place. After four days there, we flew here. 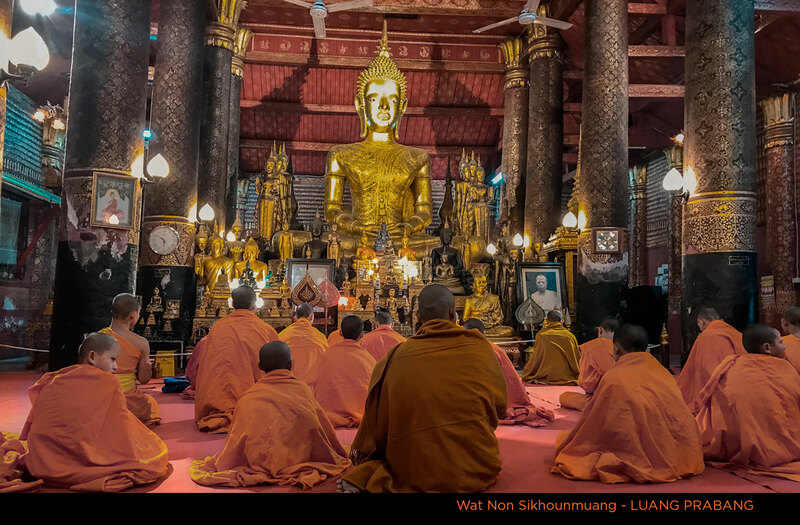 There are over 30 Buddhist temples (wats) in Luang Prabang. Most are associated with a monastery, so it is common to observe prayer sessions throughout the day. 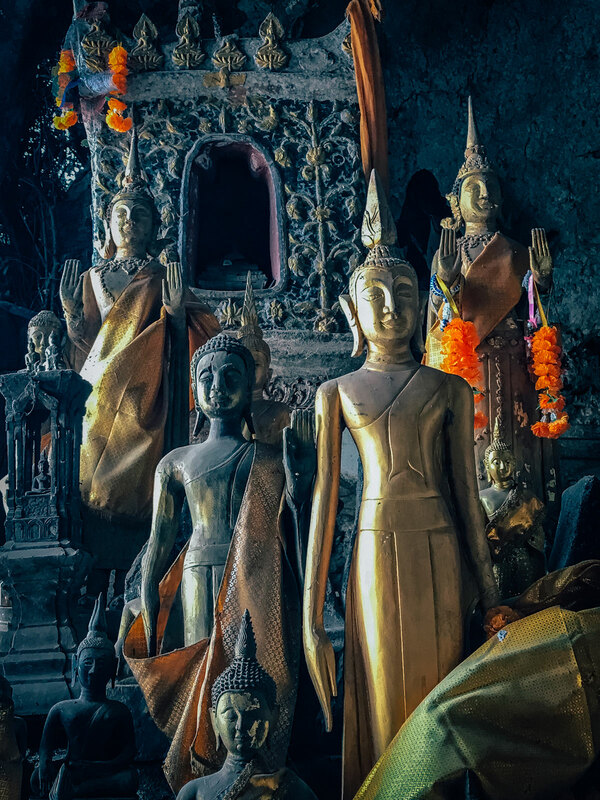 As an example, here are a few highlights of the most famous one, Wat Xieng Thong. 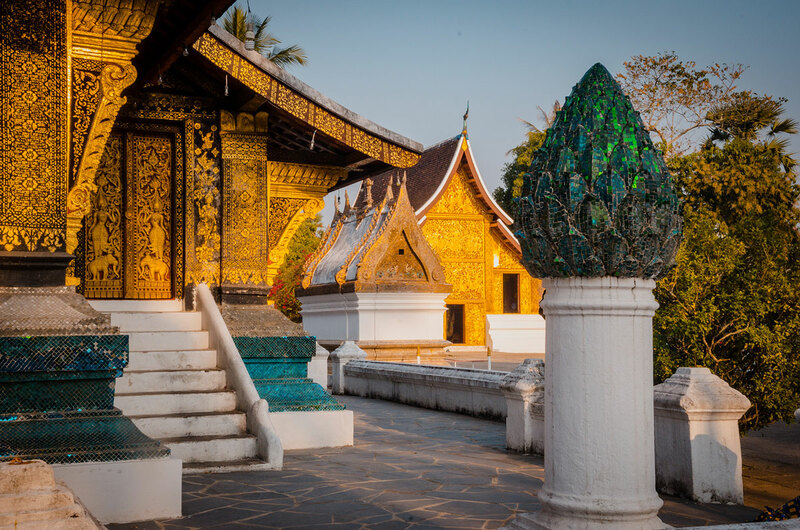 Wat Xieng Thong is arguably the most beautiful and historically rich temple complex in Luang Prabang. The site is famous as a coronation site for Lao kings and annual festivals. The original temple was built in 1560 has narrowly missed destruction during several invasions. There were major repairs and restorations during the 1960s. The temple is a complex of buildings, stupas and artistic structures. 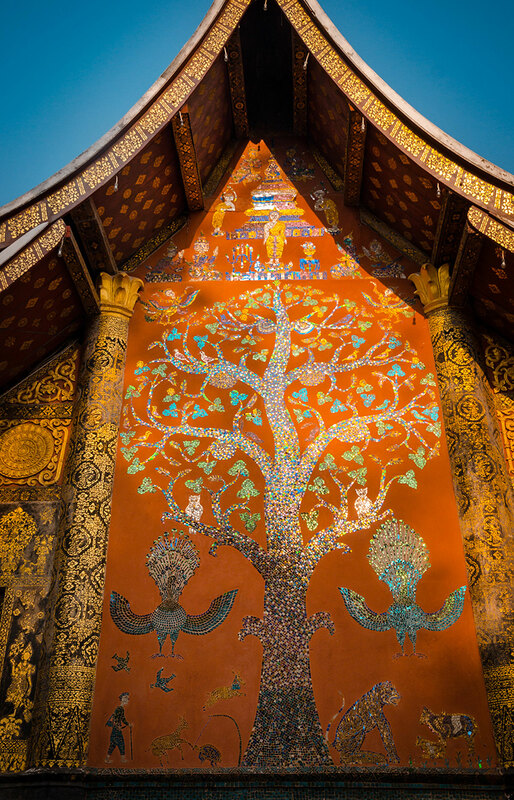 It was restored faithfully to the original form, showing the ornate details characteristic of the Luang Prabang style. 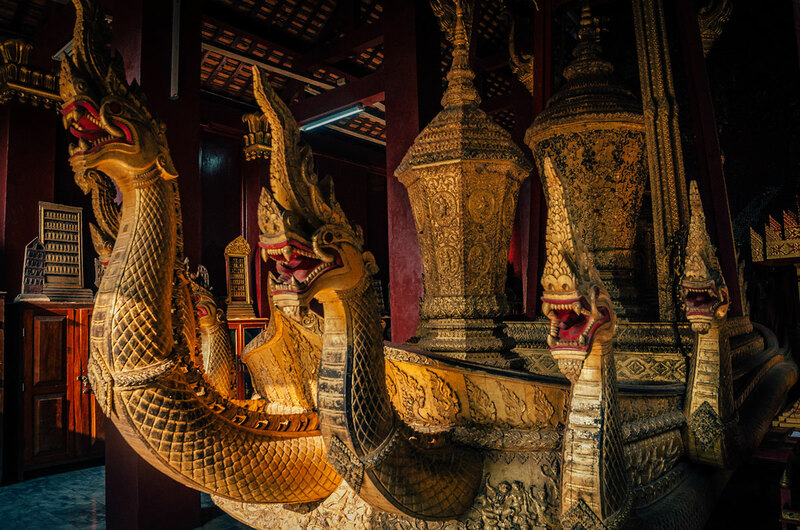 A favorite of mine was the 12-meter (40-foot) cremation chariot of the Lao King with the naga (part human and part cobra) heads. 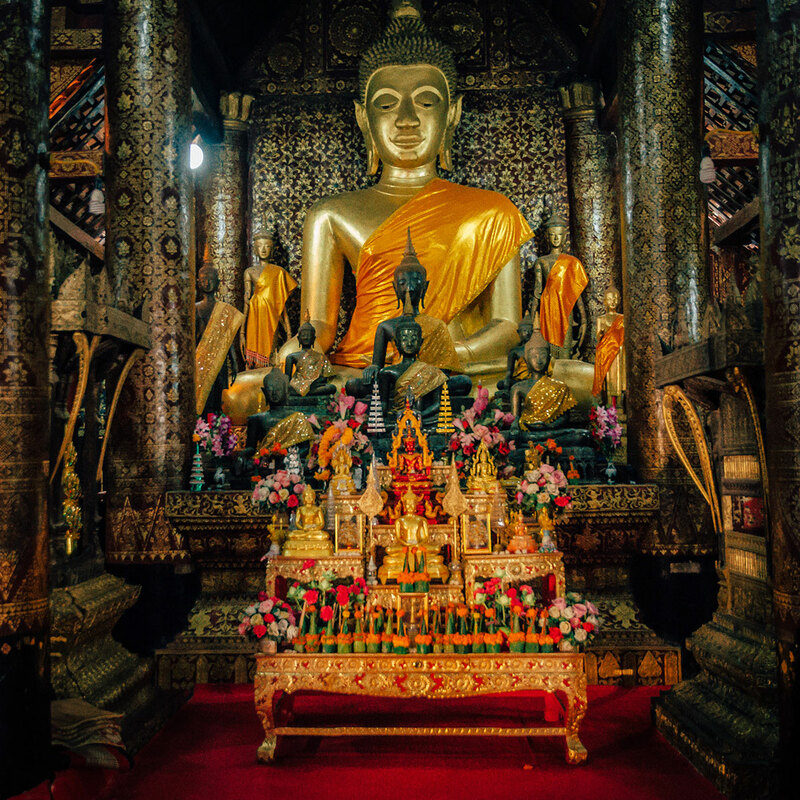 In one building, a large statue of Buddha sits on a platform, surrounded by smaller images, candles, and offerings. We allotted too little time at the end of our visit and spent only a half hour. A more appropriate time is an hour or two, as there are other items to see such as a drum tower, a Tripitaka (discourses of the Buddha) library from 1828, and an ordination hall which was part of the original temple. 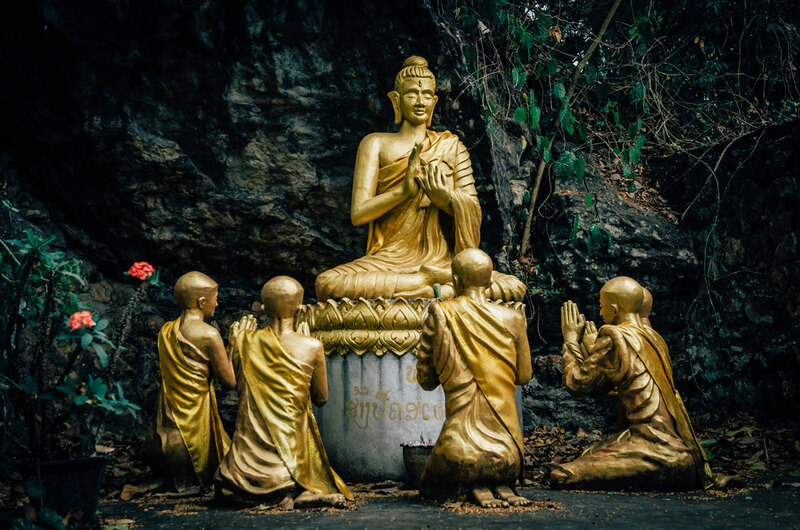 Theravada Buddhism, sometimes called Southern Buddhism, is the main branch in Laos, along with Sri Lanka, Cambodia, Thailand, and Myanmar. The name means the doctrine of the elders (i.e. senior Buddhist monks). The practice includes early morning alms rounds by monks and nuns of all ages. They cannot accept money, only food. The providers of the food are earning spiritual “merit”. The daily path and providers are arranged before the walk. This is interesting to observe if you wake early enough. However, the large number of tourists in Luang Prabang scuttling to photograph the ritual interferes with this spiritual exercise. I had seen alms rounds throughout Myanmar in the previous month, so I did not go to watch or photograph. Mount Phousi is a small mountain in the center of Luang Prabang. This mountain, whose name means “sacred hill”, is about 100 meters (330 feet) high. We went up one of the two twisting paths to the top and down the other in order to observe all of the beautifully crafted Buddhist displays. 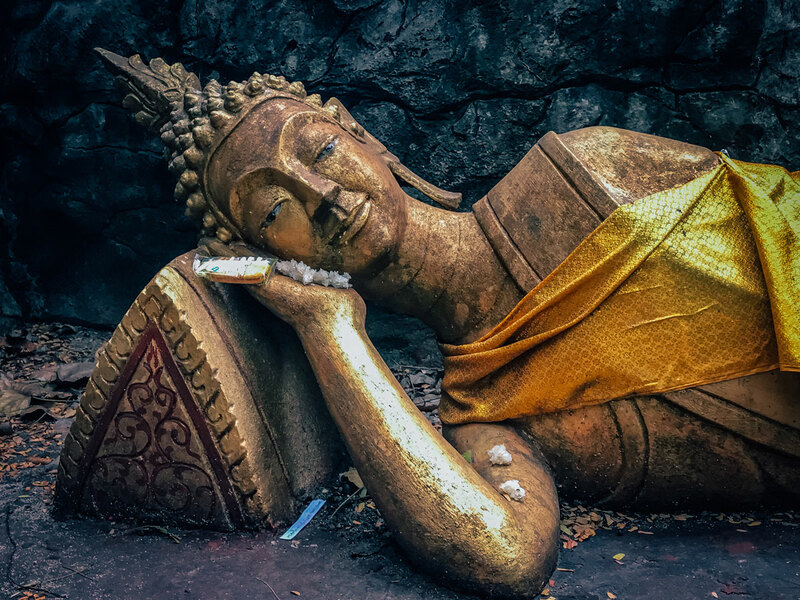 I loved the life-sized sleeping Buddha, particularly the texture, gold robe and simple alms. 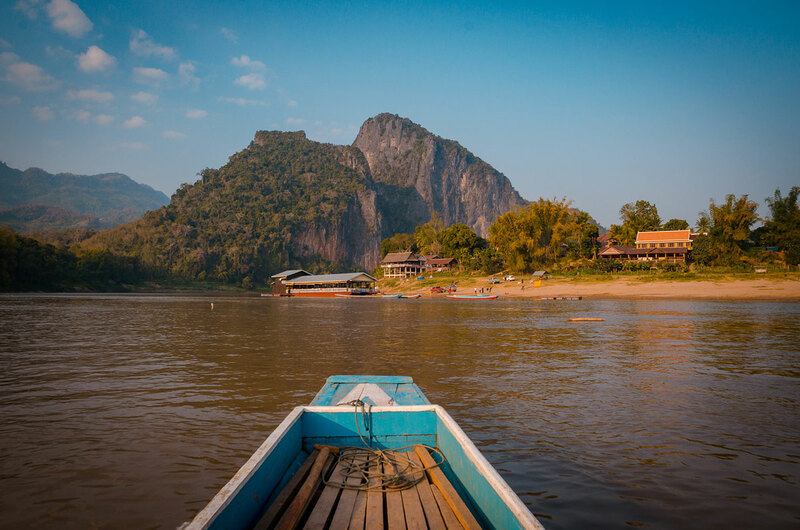 We saw many panoramic views of Luang Prabang and the Mekong and Nam Khan Rivers. On the top of the mountain is a narrow platform with a small Buddhist temple and a golden stupa. 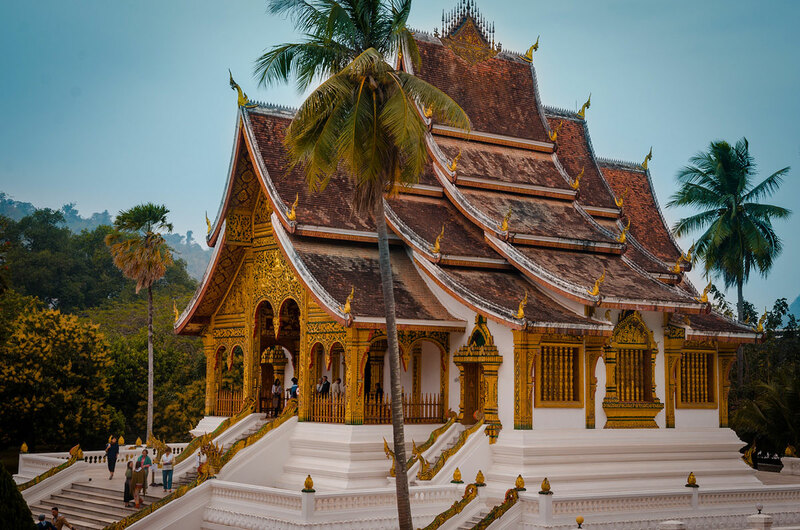 The Royal Palace Museum holds exhibits that stretch back through several centuries tracing the history of Laos and Luang Prabang. Also known as Haw Kham, it was built as the monarchy’s residence. The current structure was built in 1904 after the previous palace was destroyed in 1887 by invaders. In 1975, the monarchy was overthrown by the Communists and the royal family were taken to re-education camps. The palace was then converted into a national museum. We were required to put cameras, shoes and bags into free lockers, so we have no pictures of the interior. We paid an admission fee of LAK 30,000 ($3.75) / per person. We walked through the family’s preserved rooms, as well exhibitions of religious objects, weapons, and art in the hallways. We also saw the garage that contained the cars collected by the last king. The grounds are a wonderful place for a portrait. Another building in the complex is Hwa Pha Bang Temple, which has an interesting layered roof. Unlike the other temples we saw, this one is new, built in 2006. TAEC is a small museum exhibiting cultural items from the ethnic groups of Laos. The exhibits, with their detailed descriptions, helped me understand the ethnic mosaic of the county. We spent considerable time examining clothing, household items and religious artefacts. 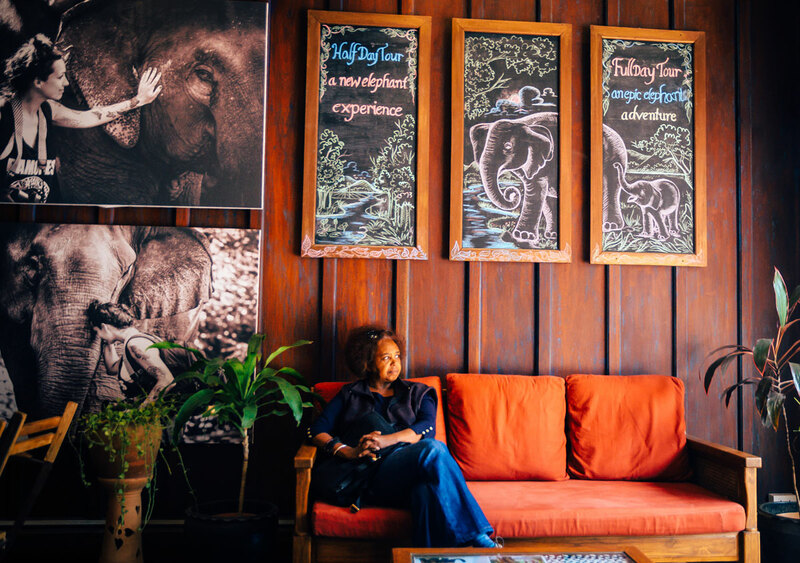 TEAC sells many quality items made by Laotian artisans from various ethnic groups. We paid an entrance fee of LAK 25,000 (about $3.10) per person. 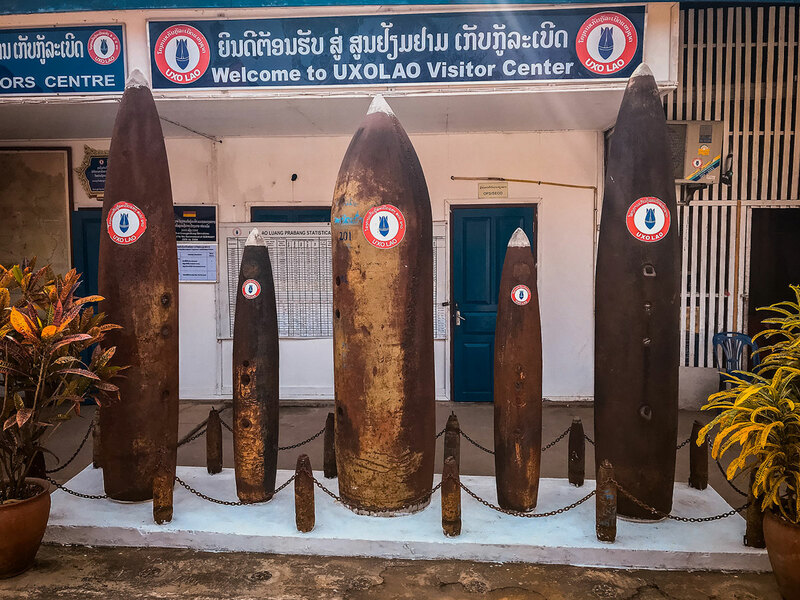 After spending time in the UXO (Unexploded Ordinances) Museum, I believe it is a must-see in Luang Prabang. While the museum has only a few small rooms, it documents the incredible crisis of unexploded ordnances from the relentless carpet-bombing by the US during the Vietnam War. In the late 1960s and early 1970s, over 580,000 missions bombarded the country to disrupt the Viet Cong’s supplies lines and troop movement. The problem is that many of the bombs did not explode. So, an unwitting person may step on one that is covered by soil, detonate it and tragically lose limbs or die. It is a particular problem with children. While this condition has existed for 50 years, it is estimated that it may take another century to completely rid the country of this devastating condition. This is an excellent but distressing example of the unanticipated consequences of war. I am an aficionado of waterfalls and have spent many days photographing them. 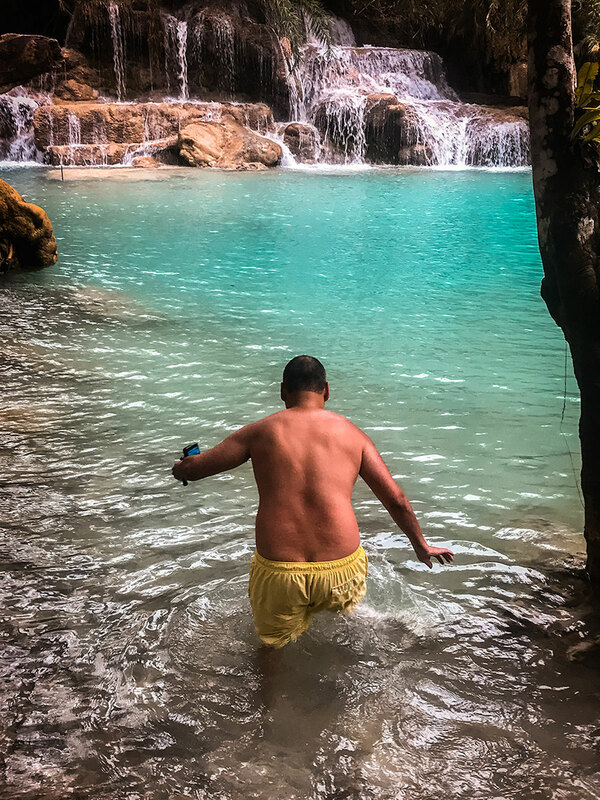 I especially liked the series of falls and pools of Kuang Si Waterfall, which are an hour drive south from Luang Prabang (30 kilometers, 18 miles) on Route 1. We hired a driver and a van for $35 + $5 tip to go there, wait and drive back. The sign at the entrance is a good example of the “bubble script” of the Lao language. The admission fee was LAK 20,000 ($2.50) / person. We arrived rights when the park opened (8am). There were few others there for a while, so I could easily set up and shoot. Khadija and Mike took in the series of outstanding views and proceeded, while I spent a very long time photographing with my tripod. The pools under the waterfall are perfect for swimming and wading. However, when we there the water was cold and only one intrepid Chinese man tried it with his phone so he could prove his intrepidness. At the top of the main trail, we saw the largest falls (60 meters, 200 feet). Next to the Kuang Si is the Asiatic Black Bear Rescue Center where they reside after being rescued from poachers or illegal trading. We watched from the viewing platforms as they moved about the trees, swings, and bars. We did not have to pay for admission but donated to this worthy cause. 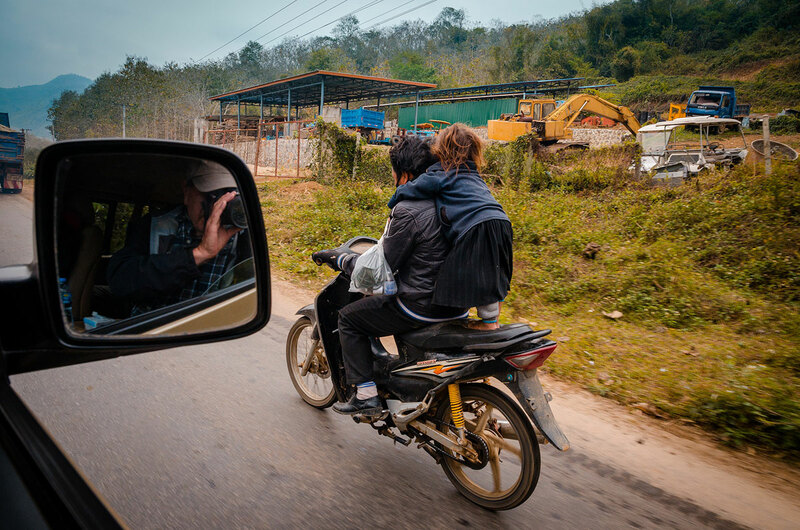 On the way back, we saw a father and daughter riding on a motorbike. In an obvious understatement, driving regulations are laxer in most of Asia that in the US and Europe. 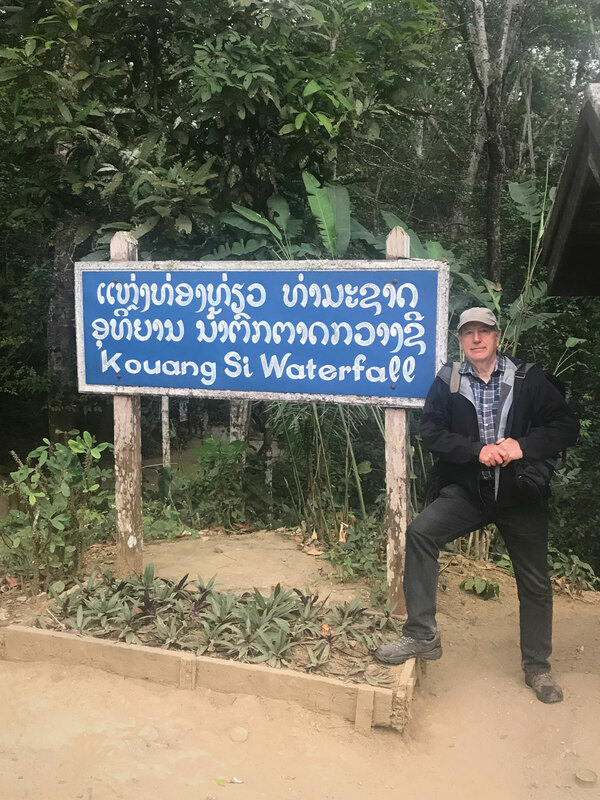 We drove an hour from Luan Prabang to the Pak Ou Caves about 30 kilometers (8 miles), about the same as to Kuang Si Waterfall, but north in the other direction. We hired a driver and van for $50. We started too late to consider the alternative of taking a long tourist-boat instead. 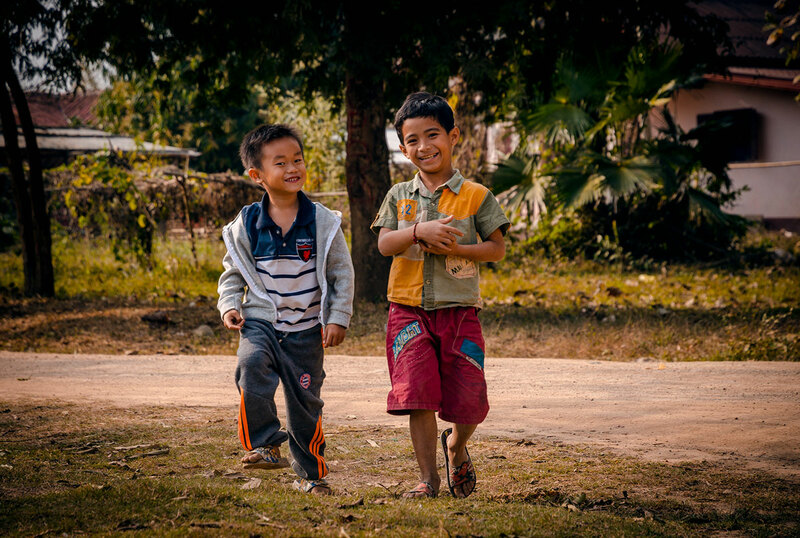 In the village, there is a temple, a few places to buy locally made fabrics and, of course, smiling little children. In the village, we paid the admission fee of LAK 20,000 ($2.50) / person for the caves. 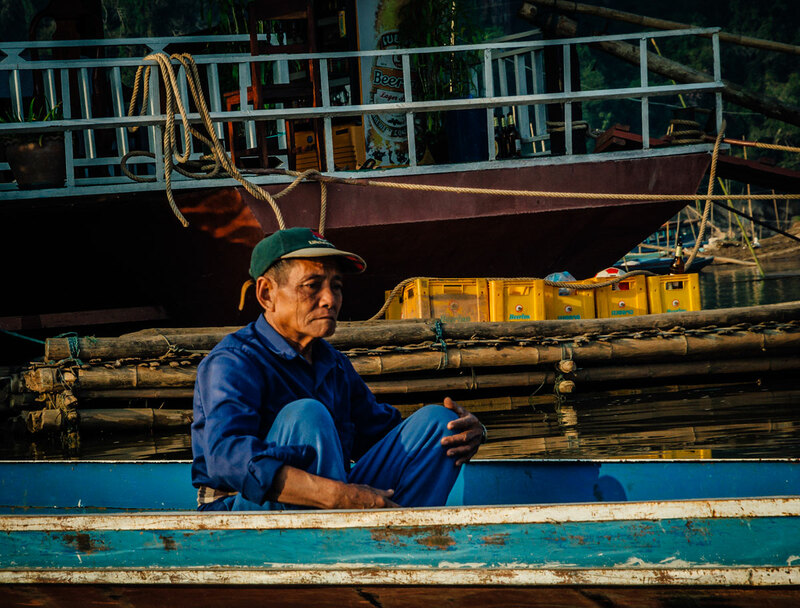 We then hired one of the canoes for the 10-minute ferry across the Mekong. 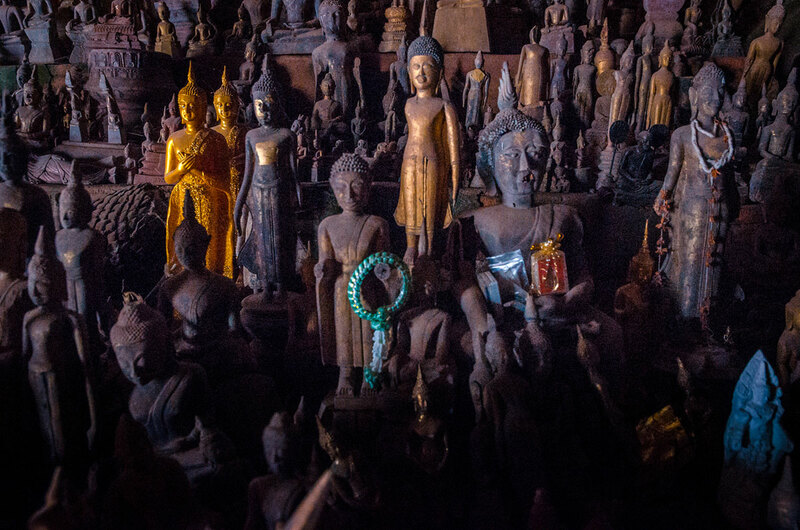 The caves are famous for their thousands of Buddhas, left there for hundreds of years. We climbed the steps for about ten minutes and went first to the lower cave, tnamed Tham Ting. We saw a fat Buddha greeting us before we entered. The air was full of incense. 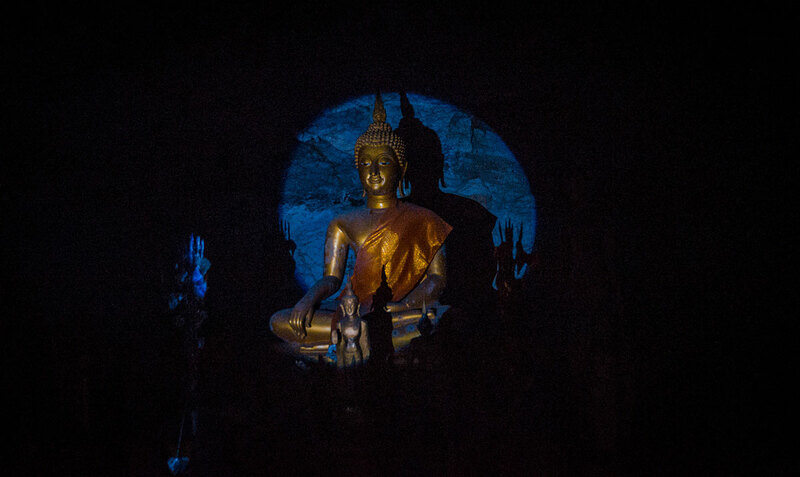 There were a number of Buddha statues around, but the main one was in the back, highlighted by a blue, circular light. We then went to the upper Tham Theung cave, which is chalked full of Buddhas. A lot of the cave was dark and we needed a flashlight to see. In the parts with some natural light, some statues appeared to be an army standing ready for an invasion. Others seemed like a royal guard by a throne. After viewing the caves, we took our canoe back and witnessed the soft light of setting sun. Sitting at a café or walking the streets and observing the street life was a constant activity of ours. 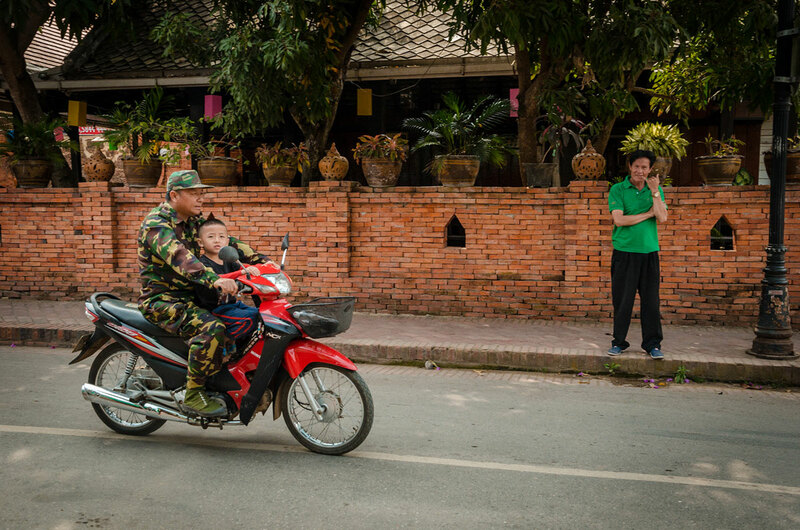 During the afternoon, we saw many parents on motorcycles with their children. 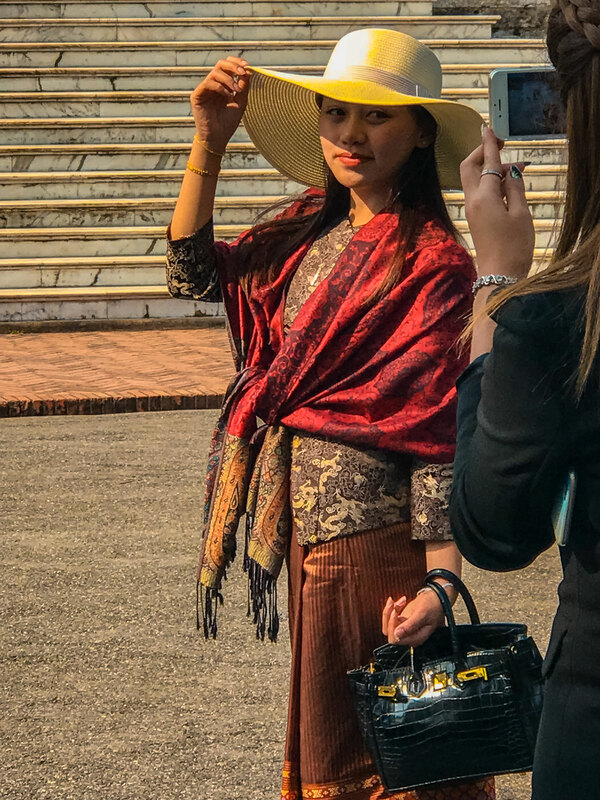 We saw young ladies who were identifiably Laotian by the clothes, but by demeanor could be from anywhere in the world. 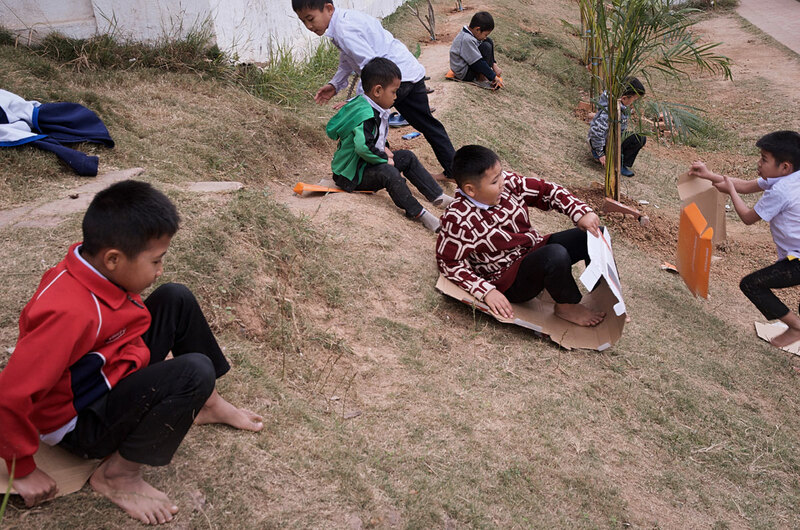 There are a lot of children in Laos. We enjoyed watching them play in many improvised ways. We found that Luang Prabang has a number of boutique shops selling quality products and not cheap, fungible souvenirs. 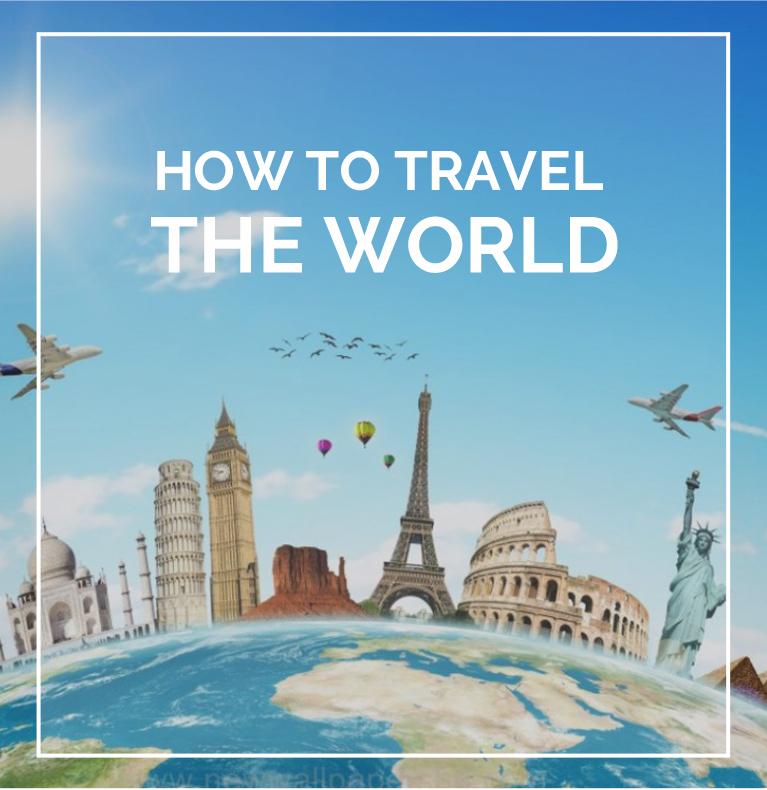 Here are a few places I recommend. 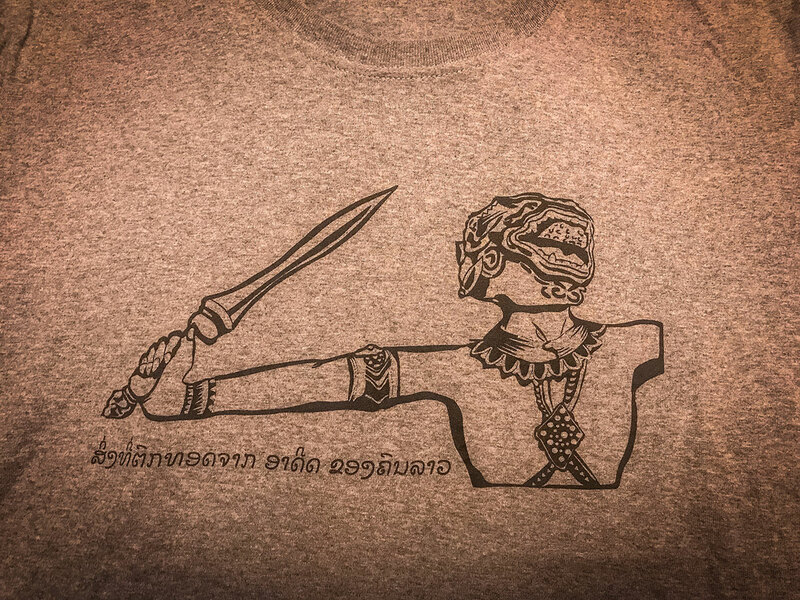 At Ma Te Sai (https://matesai.com/), I bought a T-shirt with a design from a 1950’s Laotian postage stamp. After a year of many washings, it has not shrunk and the picture has not faded. 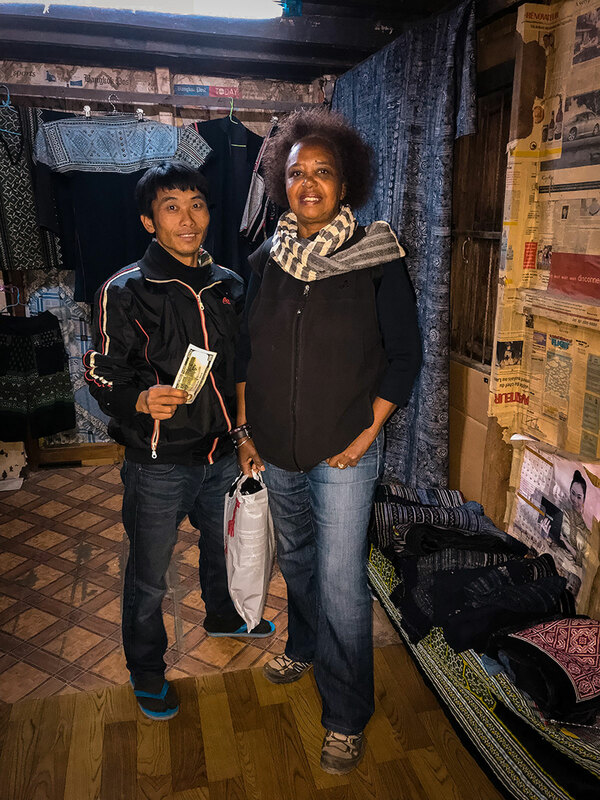 On Kounxoau Road, we found a shop selling handmade, traditional Hmong-design bedspreads and blankets. The shop had fabrics with bright or subtle colors and tight weaving. We bought a bedspread, which is hanging behind Khadija in the picture below. I found the Lupa Fine Arts Gallery which sells photography and paintings by Vunuhai. I loved his work and was fortunate to chat with him. Vunuhai (http://vunhuhai.com), who is of Vietnamese ancestry, studied at the Hanoi University of Fine Art. He is a painter who specializes in an incredibly realistic style, from aged local people to Buddhist monks. 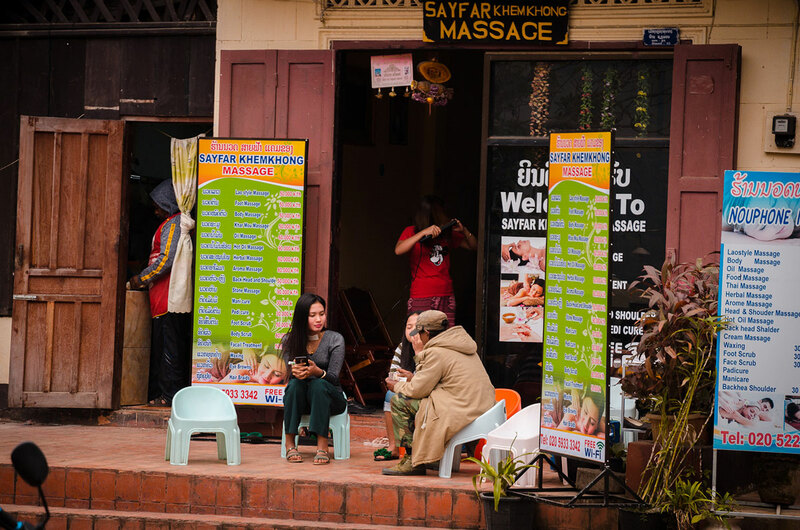 In Luang Prabang, as in many parts of Southeast Asia, there are many places to experience a massage. I found it impossible to discern which place or masseuse would be good, as it depends on who the available. As long as the joint does not look too disreputable, it probably would be probably be OK.
Mandalao Elephant Walks (https://mandalaotours.com/) is a reserve that allows people to interact with elephants, by feeding, washing and walking with them. This approach, rather than riding them, humanely treats these highly intelligent animals who have been rescued from logging work. 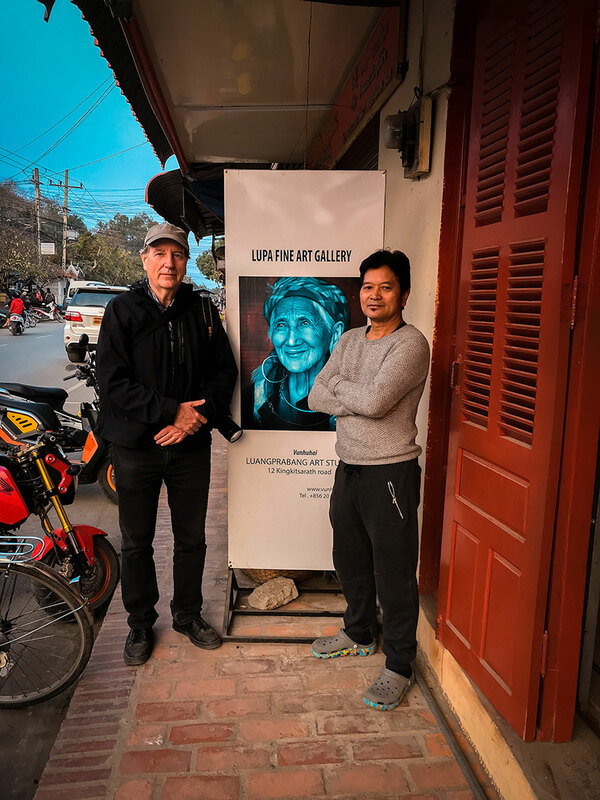 It was started by a gentlemen from Colorado, where I was born, whom I had a long talk with about living in Laos as a foreigner. Khadija was waiting in the office while I was learning about the operation. e would have partaken in the adventure but there were no spaces available while we there. Each night we treated ourselves to an upscale restaurant for a splendid meal, usually spending $35 to $45 per person, including drinks. There were a number of very good ones which were significantly cheaper. Here are ones we recommend. I am not a foodie, so I have not included detailed descriptions of our dishes, nor taken pictures of the plates. Tangor (https://www.thetangor.com/) had friendly service and a relaxing atmosphere (despite being packed) and served a fusion of French and Asian cuisine. The owner replaced a salmon dish after it was cooked, because he deemed the quality of the fish inadequate. We ate in L’Elephant Restaurant (http://www.elephant-restau.com/), situated in a 1960’s colonial house. They served us excellent French and Laotian style dishes. The waitress said they grow many of the ingredients in the restaurant’s gardens and the rest comes from local sources. The outside walls are a series of doors which can be opened to cool the room. At Blue Lagoon (http://www.blue-lagoon-restaurant.com/) we ate Laotian and Swiss dishes and artistic salads. It has lanterns on the wall and has a décor reminding me of a library in a mansion. However, when we were there, a group of about 15 Americans came in. They were speaking so boisterously that it interrupted the tranquility of other diners. They did not realize their behavior was fine in Dallas BBQ but was unsuited for this restaurant. 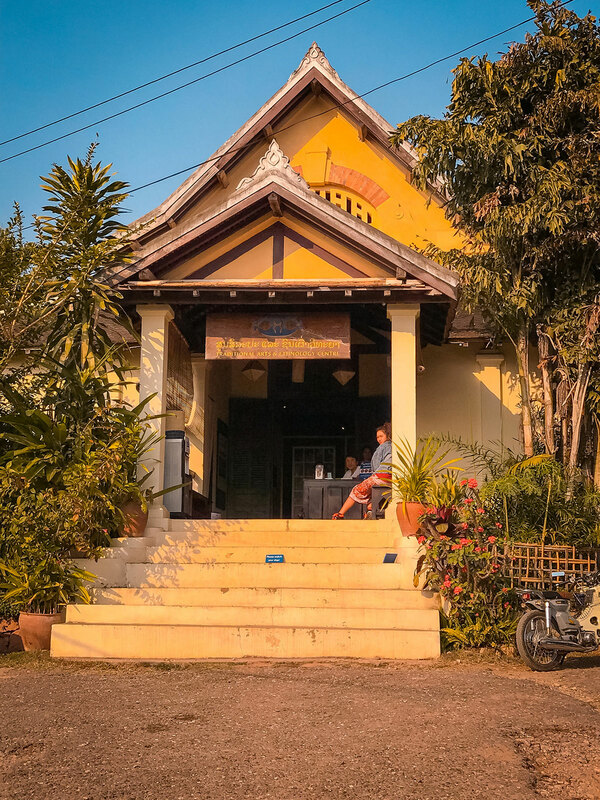 Luang Prabang has a number of bars and pubs, but it is not the all-night party place that Siem Reap is. 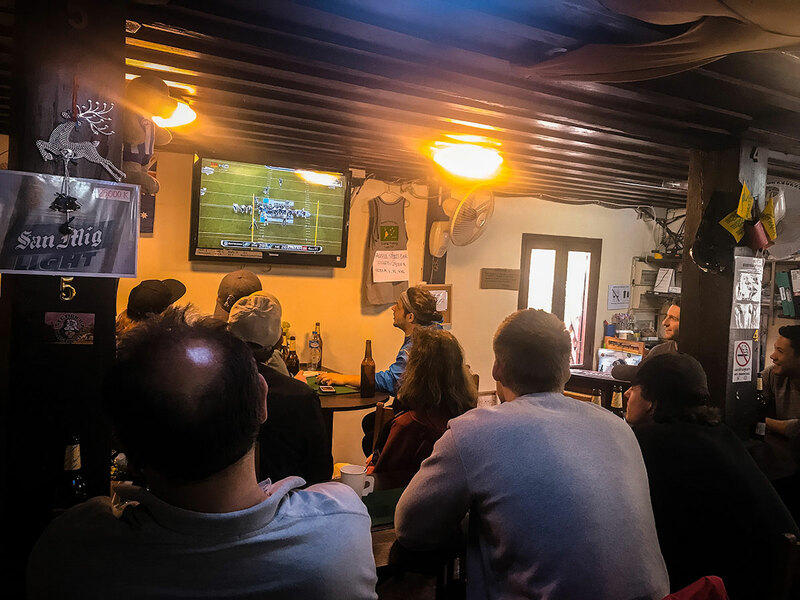 Mike and I woke early Sunday morning and went to the Aussie Sports Bar which had several televisions airing the 2018 Super Bowl game between the Philadelpia Eagles and the New England Patriots. The bar knew they would be busy and charged a LAK 10,000 ($1.25) cover charge. The audience was maybe two-thirds Americans and the rest were tourists from English speaking countries. The crowd was lively because it was high scoring game, with the Eagles prevailing 41 to 33. We stayed at the Villa Maydou in the “traditional” rooms, as opposed to the “heritage” rooms which are registered in the UNESCO World Heritage Program. Our rooms are built with dark heavy-wood beams and boards. The furniture was made of the same or similar wood. It is about a ten-minute walk to Mount Phousi and an additional ten-minutes to Sakkaine Road. It is next door to a monastery and close to several small restaurants and laundry mats. It has a pool and a restaurant which we lunched in once and had breakfast daily. The cost was $84 per day (including breakfast), which we thought was reasonable. 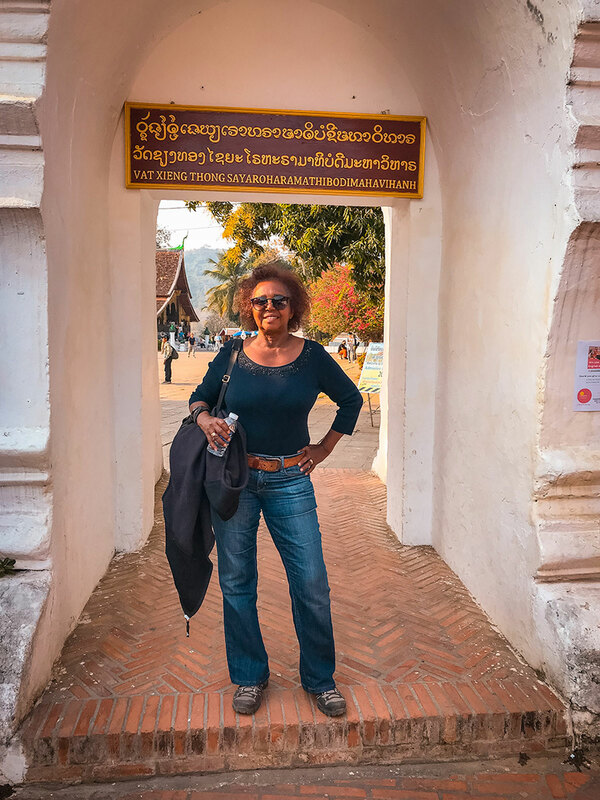 At the end of our stay, Khadija expressed her impressions on Luang Prabang and how it has changed since she was last here. 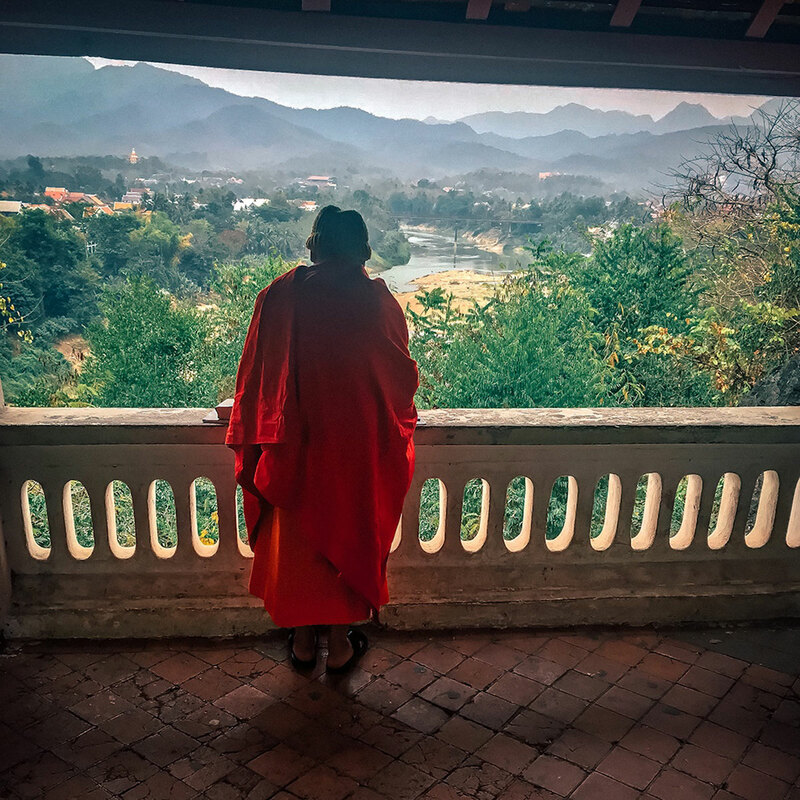 My takeaway is Luang Prabang is a place to see Buddhism integrated in the community, travel through mountainous forest, and have a good meal. There is little pollution and the pace is slow. There is no other place in the world like it. 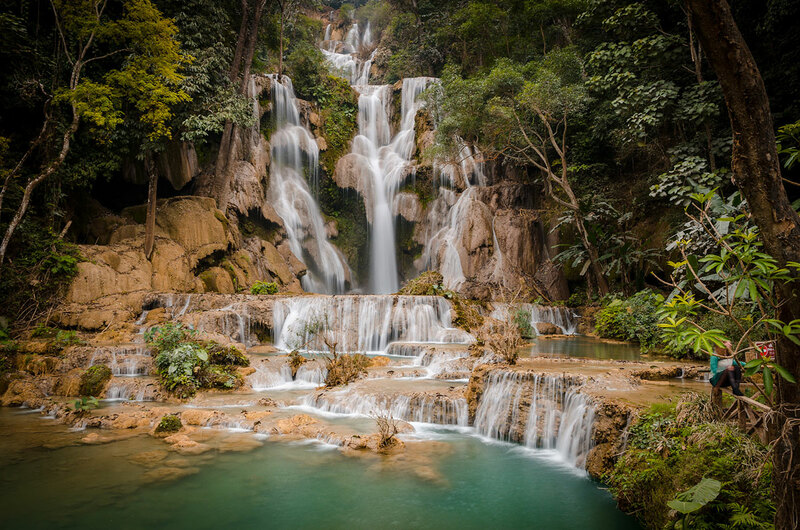 Hey Buddy!, I found this information for you: "Luang Prabang – The Jewel of Laos". 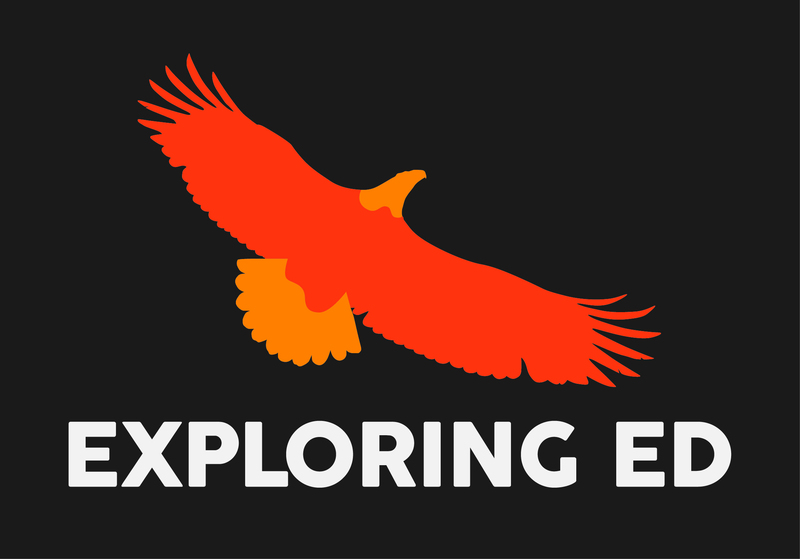 Here is the website link: http://exploringed.com/luang-prabang-jewel-laos/. Thank you.